There you are, roasting your coffee with RoastLogger fired up. You click the Save button, and go along with the rest of your roasting business. Later on when perusing your Inbox, you notice that a roast is missing….hrmmmmm. This isn’t a huge issue since RoastLogger was designed to handle this. Profiles are saved to your computer before they’re uploaded. If there was some type of network error which prevented the initial upload to roastlog.com from succeeding, RoastLogger will try again later. However, RoastLogger doesn’t do a good job of letting you know what’s going on. We’ve fixed that. If something didn’t go quite right, you’ll now have a better idea of what’s going on with a little notification as well as a yellow highlight on the problematic roast. Once you hit the Sync button, as instructed, and the roast is uploaded, the yellow turns gray and you get the Roast Id back, signaling that everything is right in the world. As a programmer, I try to avoid the mouse as much as possible. I’m simply faster doing my job when my fingers are on the keyboard rather than moving the mouse around and clicking on things (this is why I love Vim so much). As a roaster, you don’t want to click the mouse either. There is now a shortcut to start recording a roast, and save that roast when you’re ready…the spacebar. Think iTunes when you start and stop a song, or video player when you start/stop a video. Same thing. I know of at least one person who is going to be thrilled to have this….hopefully there will be others. Notice the "Space" shortcut next to Record and Save. After you save a roast, it just sits there in your Roast Queue letting you know what you have already done, but not doing much good beyond that. A few folks expressed a need to actually pull up the profiles they just did on the plot to compare with new roasts. Well, you can now do that. Any roast which you’ve saved and uploaded to roastlog.com is now selectable in the Roast Queue, and that profile will be drawn on the plot. We still have our Starred Roast system and that is still the method of marking your favorite profiles which will automatically be displayed when you roast a particular coffee. But, for running experiments or quick checks where starring a roast is too much effort, selectable Roast Queue profiles are your friend. Note, this one may actually show up a bit later since there are a couple of outstanding bugs…but it is coming, promise! I’ve known about this feature forever and it simply took a long time to get it right. If you add 20 coffees to your Roast Queue, then decide you’re going to skip coffee #10 or do it last, it’s currently a headache to deal with. I’m very happy to say that you can now just grab any cell in a given row and drag the entry to its new home. 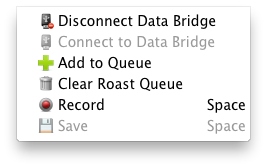 Select any cell in the Roast Queue and drag it to its new position. Not only can you reorder, but you can delete from arbitrary spots in the Roast Queue as well. Right-click a cell and you’ll get a little context menu with one selection, “Delete from Queue”. After clicking “yes” to the confirmation window which appears, the item is removed like magic. Note, I find it funny that I’m still calling this a queue since I originally thought it would act like a real computer science queue….we’re sort of a cross between a queue and array at this point. Look forward to RoastLogger 2.2.0 within the next week or two. I’m confident these changes will make the program easier to work with. If you have any other suggestions on how to make RoastLogger better, let us know via support.roastlog.com! The spacebar short cut is great, although don’t forget where your cursor is! Have you thought about ROR? Getting the rate of increase of temperature over an adjustable amount of time would be a game changer, IMO. Great update! Excited to be working with your product! **and coffee in one place.